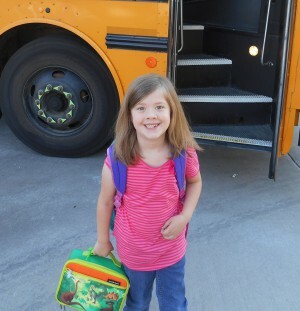 Kalena starts first grade today, and somehow that seems SO much older than kindergarten. Maybe it’s that she’ll be gone from 8 to 4, or maybe it’s that I packed her a lunch, or maybe it’s watching her get on a school bus instead of dropping her off, but whatever the reason, today seemed very official. Here she is, ready to go! Getting on the bus! We live close enough to the school that we have to pay to bus her, but according to my calculations we’ll spend less to bus her than to drive back and forth to her school twice a day. Plus, not having to load and unload 4 kids multiple times a day will save my sanity. And we can see her bus stop from our front door! Anyway, here’s to a great year! Yeah, remember when the first day of school was AWESOME? And the fresh pencils and backpacks smelled so good? If I were her, I would have carried my lunch box, too. Fresh school supplies are the BEST. I want a set for myself. 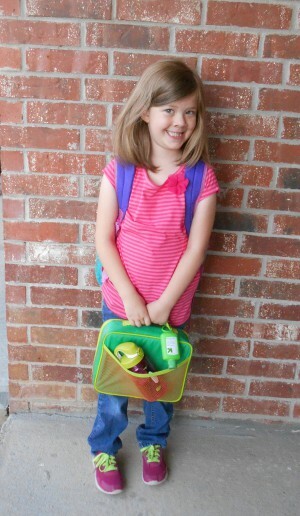 All the first-day-of-school stuff makes me very nostalgic for my own first days. I think I saw a pic on IG maybe and totally honed in on the anti-bac on the lunch box. Genius!! Our schools have been having the kids wash hands first thing when they arrive in the morning which I also think is great. I am not a germaphobe by any means, but man I hate the school germs. Kalena looks lovely and very grown up, and I’m so happy for you that you were able to simplify your schedule with the bus, etc. Here’s to a great year! My sister said the same thing about seeing the sanitizer! I’m a big fan. Plus she thinks it’s super fun, so win-win.